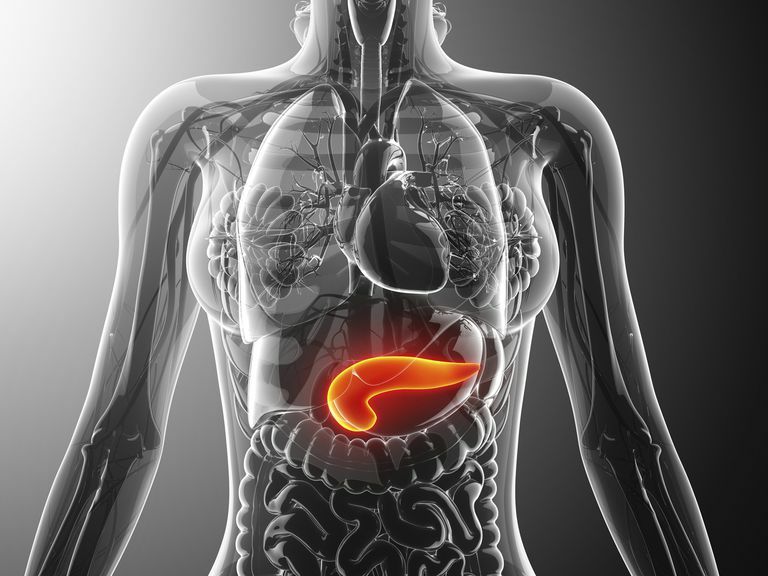 Zollinger-Ellison Syndrome (ZES) is a rare disorder that causes one or more tumors to form in the pancreas or the upper part of the small intestine called the duodenum. It can also cause ulcers to develop in the stomach and the duodenum. Zollinger-Ellison syndrome is rare, and though it may occur at any age, people between the ages of 30 and 60 are more likely to develop it. Also, of all the people who suffer from a peptic ulcer, only a tiny percentage of those people will have Zollinger-Ellison. The tumors are cancerous in 50 percent of the cases. They secrete a hormone called gastrin that causes the stomach to produce too much acid, which in turn causes stomach and duodenal ulcers (peptic ulcers). The ulcers caused by ZES are less responsive to treatment than ordinary peptic ulcers. What causes people with ZES to develop tumors is unknown, but approximately 25 percent of ZES cases are associated with a genetic disorder called multiple endocrine neoplasia. This pain usually develops 30 to 90 minutes after a meal and is often relieved by antacids. Zollinger-Ellison syndrome is caused by a tumor (gastrinoma) or tumors in the pancreas and the upper small bowel (duodenum). These tumors produce the hormone gastrin and are called gastrinomas. High levels of gastrin cause overproduction of stomach acid. This increase in acidity can lead to the development of peptic ulcers in the stomach and duodenum. Blood Test: A blood test is performed to see whether there is an increased gastrin level in the blood. An elevated level of gastrin may indicate tumors in the pancreas or duodenum. Barium X-ray: The patient drinks a liquid that contains barium, which will coat the walls of the esophagus, stomach, and duodenum. X-rays are then taken. The doctor will then view the X-rays, looking for signs of ulcers. Upper Endoscopy: The doctor examines the inside of the esophagus, stomach, and duodenum with an instrument called an endoscope, a thin flexible lighted tube with a lens. The endoscope is inserted through the mouth and down the throat, and into the stomach and duodenum. The doctor can look for ulcers, and can also remove a tissue sample, called a biopsy, for examination in the laboratory to identify if there is the presence of gastrin-producing tumors. Imaging Techniques: A doctor may use a computerized tomography (CT) scan, a magnetic resonance imaging (MRI) scan, and ultrasound, or a nuclear scan in an effort to pinpoint where tumors may be located. A CT scan is a diagnostic test that uses X-rays with aided by computer technology. The X-ray beams are taken from many different angles to create cross-sectional images of the patient's body. Then a computer assembles these images into a three-dimensional picture that can display organs, bones, and tissues in great detail.With the MRI scan, magnetic signals are used rather than X-rays to create images of the human body. These images show the differences between types of tissues. An ultrasound sends out high-frequency sound waves which go into the area being examined and bounce back when they hit an organ. This is processed by a computer, which produces a map of the area being scanned. With the nuclear scan, radioactive substances are introduced into the body that permits a gamma camera to detect tumors. In 50 percent of cases of Zollinger-Ellison, the tumors are cancerous (malignant). If the tumors are cancerous, there is a risk that cancer will spread to the liver, the lymph nodes near the pancreas and small intestine. Proton Pump Inhibitors: These are the most effective medications for Zollinger-Ellison syndrome. Proton pump inhibitors are quite powerful and suppress acid production and promote healing. Examples of proton pump inhibitors include Prilosec, Prevacid, Nexium, Aciphex, and Protonix. Acid Blockers: These are also called histamine (H-2) blockers. These medications reduce the amount of hydrochloric acid released into the digestive tract. This helps to relieve ulcer pain and encourage healing. Acid blockers work by keeping histamine from reaching histamine receptors. Histamine receptors signal acid-secreting cells in the stomach to release hydrochloric acid. Examples of acid blockers include Tagamet, Pepcid, Zantac, and Axid. Acid blockers don't work as well as proton pump inhibitors do, and may not be prescribed by the doctor. For those people who do use acid blockers, they need high, frequent doses for them to be effective. As stated above, in 50 percent of cases of Zollinger-Ellison, the tumors are cancerous. Early diagnosis and the surgical invention can achieve a cure rate of only 20% to 25%. However, medical information states that gastrinomas are slow growing, and patients may live for many years after a tumor is discovered. Acid-suppressing medications are very effective at controlling the symptoms of acid overproduction. For a diagnosis, you need to see your healthcare provider. At this time all aspects of this condition, along with treatment options and ongoing care and monitoring of the condition, should be discussed with your doctor. After diagnosis, if you should experience and new or worsening symptoms, these should be reported to your doctor.